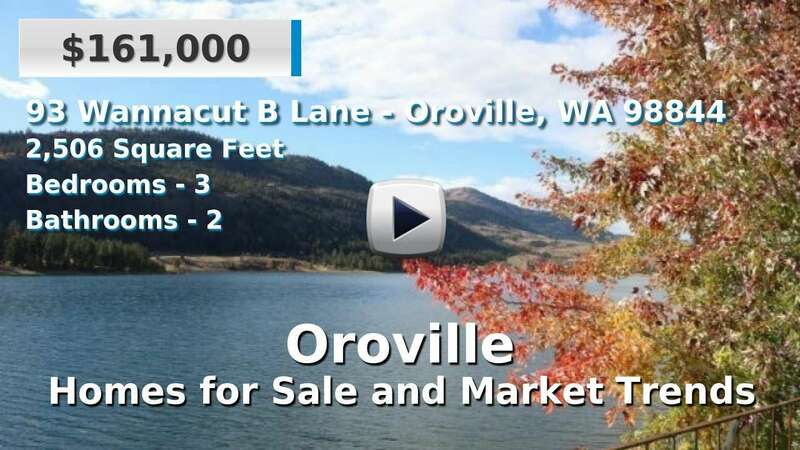 Oroville is a small city in northern Okanogan County, just a few miles south of the Washington-British Columbia border. It sits on the southern shore of Osoyoos Lake, half of which is in the U.S. and the other in Canada, and is at the convergence of the Okanogan and Similkameen Rivers. Oroville has long been an agricultural region and is full of fruit orchards and vineyards. The many lakes, rivers, and public lands draw countless visitors each year; in fact, the Pacific Northwest Trail, 1,200 miles from Montana to the Pacific Ocean, crosses through downtown Oroville. The nearest town, Tonasket, is about 17 miles south, and Omak, the county's largest city, is about 40 miles south of Oroville. The available houses for sale in Oroville really differ in style and size, depending on which neighborhood home buyers are shopping for. Whether it's a lakeside cottage or a ranch style homestead, homes here tend to be well-established, rather than newer. 3 Beds | 1.75 Baths | 1258 sq. Ft.
4 Beds | 2.5 Baths | 2240 sq. Ft.
3 Beds | 2.75 Baths | 2236 sq. Ft.
3 Beds | 1.25 Baths | 999 sq. Ft.
2 Beds | 0.75 Baths | 1400 sq. Ft.
3 Beds | 2.5 Baths | 1600 sq. Ft.
3 Beds | 2 Baths | 2018 sq. Ft.